All In One Package Rock-star Saint For Real, Saint Dr. Ram Rahim Singh Ji Insan - Discography. 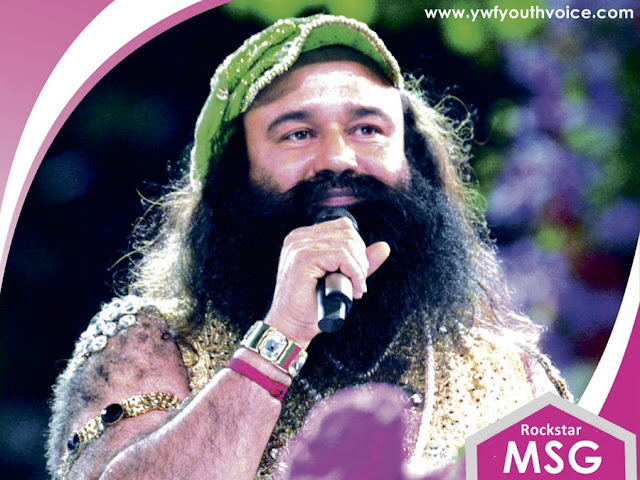 Dr. MSG - Lyricist, Singer and Music Director. Music For Everyone, different style and languages. Global Plaque by Universal, Platinum Plaque by IFPI and Sony DADC International. Music is believed to be the language of our spirit, it's the strongest form of magic, it can change the world as it can change the people. You may have heard about Christian rock artists and bands like Skillet many time, but have you ever heard of Spiritual Rock? I guess not, there is this Rock-star Saint named Gurmeet Ram Rahim Singh Ji Insan who has not only created this unique genre but also took it to the whole new level. Saint Dr. Gurmeet Ram Rahim Singh Ji Insan sings for almighty, Allah, Waheguru, God, Bhagwan, his guru Shah Mastana and Shah Satnam, this genre of music which connects the listeners with spirituality is defined as Spiritual Rock. He writes himself, sings himself and also compose music himself. He has this unique talent of creating a whole new song within few minutes. He likes creating songs while traveling, to utilize free time. Saint Dr. Gurmeet Ram Rahim Singh Ji Insan has released songs in Hindi, English, Punjabi, Rajasthani and Haryanvi. Dubbed song in other languages like Tamil, Telugu etc for MSG movies. Rockstar baba doesn't only sing in different languages, he can sing in different voices and styles too. "Apun Ko To Tu Chahiye" from his album Highway Love Charger is in Tapori style to connect street folks with almighty. A 16minutes track "Chocolate" was sung by him in voice of a child live during stage performance. "Peer ke Nurani Naina" a hour long Qawali was performed live by him which was later released in DVDs. Twenty One audio/video albums have been released till now, all of them were huge hits. You may have seen musical concerts of many singing stars but Rockstar MSG shows aka Rubaru Nights are completely different. Where every star sings one to two songs on average, Rockstar Baba Gurmeet Ram Rahim Singh sings 7-10 songs and mostly all of them are completely new songs, new compositions, many of them are not even released by him. No recordings are played, he performs live at every performance. His power packed performance can even make dead man dance, lakhs of people dance to his beats in every show he performs. Till now he has performed about 150 such shows. People dance and he performs with full energy whole night. One of the most famous songs of Rubru Night is Love Charger which also gave him the title of Love Charger baba, in this track he call God as a Love Charger. He says,"just like a low battery mobile needs an electric charger, our soul needs spirituality as love charger". 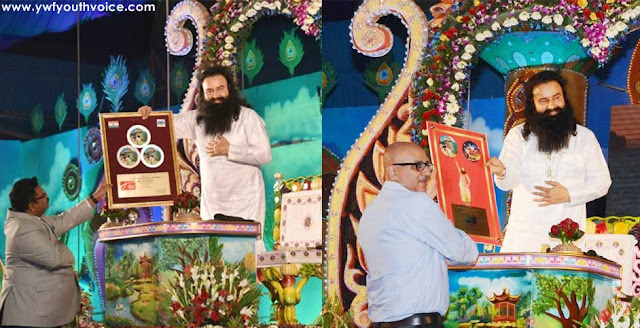 Everyone is familiar with achievements of Dr. Gurmeet Ram Rahim Singh Ji Insan as a Saint or a social reformer, Dera Sacha Sauda is famous for its Humanitarian Works worldwide, he has the highest no. of world records in his name. Here we will discuss only about his achievements in music world. 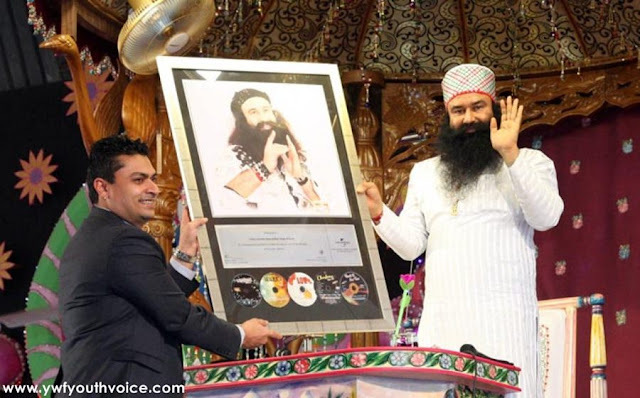 On 27th October 2013, world's renowned music company Universal awarded Saint Dr. Gurmeet Ram Rahim Singh Ji Insan with a Global Plaque for highest number of musical album sale. More than 65 lakh CDs of 5 albums sung by Rockstar Saint sold within a year. While addressing the audience Devraj Sanyal, Managing Director (South Asia) said,“The cumulative sum of the sale of all CDs of some popular singers will not even make 20% of the sale of Revered Guru Ji's CDs.” He challenged to show any other artist who can perform live in single event for 6-7 hours on stage every week and in different languages and genre. Rockstar Saint is brilliant in every field, he's known as Super-Human for a reason. We hope he releases his next spiritual album soon for Indian Youth. Everyone is super excited for his upcoming movies MSG Online Gurukul and LionHeart MSG The Warrior.